We were just talking about this today in Medic class. I was curious as to why it is alright to give NTG or another Nitrate every 3-5 minutes without worrying about the BP tanking, but didn’t have time to ask. Can you elaborate on this a little for me? 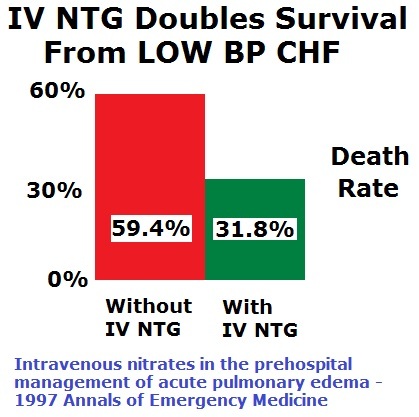 My answer is at Comments on High-Dose NTG for CHF. My question is how long did the study go on that one patient received over 50 NTG tablets and is still functioning. I didn’t think that an individual was supposed to receive more than 3 NTG tablets in 5 minutes intervals before professional medical assistance. I know the earlier NTG is administered, the better but I think that there should be a limit on how much can be can be administered to one patient in a 48 hour period before more serious medical attention should be sought. I know when my mom had a prescription for NTG she was only told to take two, NTG tablets and if a third was needed to call paramedics. And that it was needed two days in a row that she needed to stay in the hospital for observation.